Wetlands and floodplains are an important component of the ecosystem providing habitat for many fish, aquatic invertebrates, birds, amphibians and reptiles. 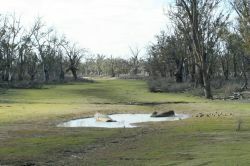 A variety of environmental processes can impact on flora and fauna directly or indirectly, including by the loss of suitable breeding, sheltering and feeding sites and isolation of populations due to loss of water connectivity, particularly between floodplain wetlands and their adjacent river system. These impacts and threats can result in a loss of aquatic biodiversity from these systems. Researchers in this theme work on understanding the base ecology within these systems, the restoration of aquatic habitats, the minimisation of threats, and understanding how managed flow regimes and infrastructure alter or facilitate the movement of aquatic species.